A new Google feature is giving a lot of prime SERP real estate to Q&A based results. An amazing opportunity to rank high and knock out the competition for the above the fold placements in the organic search results. Check out our video below. Hello, it’s Christian from Marwick Internet Marketing. And, today I just want to show you a new feature that’s been rolled out by Google recently. It came out in the United States last year and we’re seeing more and more now in the U.K. and Canada. 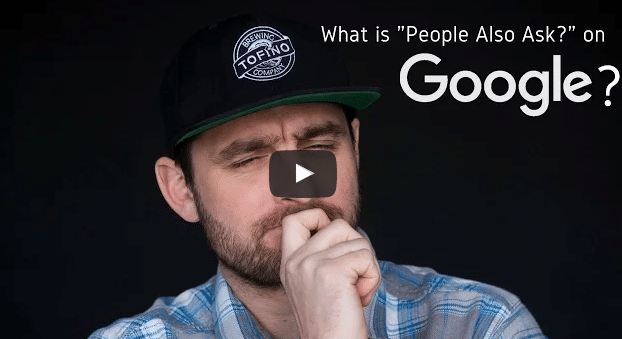 It’s Google’s new features called People Also Ask. And, why this is super important is that the new snippet has taken up so much real estate on the first page of Google for question-related answers in the SERPS (Search Engine Results Page). What you’ll see here, is I’ve typed in a question, “How do I add Google reviews?” And, you’ll notice that we’ve been seeing this snippet a lot, but more recently now we have the People Also Ask snippet. So, what Google’s doing is it’s finding content online, blogs, articles, landing pages, that answer questions that people consistently ask Google. So, again, with the advent of mobile devices, we’re finding that a lot of people are actually now using voice search. We’re being more familiar with the way that we search for keywords, or more traditional keywords by asking long-tailed questions. So, what Google is doing now, is it’s finding content that will answer similar questions. If you’re not finding the answer you’re looking for in this initial snippet, then it’s also now saying that people also ask these other questions and are these of interest to you. You’ll see here, the question was how do I add Google reviews, there’s a blog article we wrote back in 2014 that kind of answers that questions. So, we’ve always set out to write blog articles and we’ll probably turn this video into a question and answer kind of style blog. But always write blogs as if you’re answering a question, because as more and more people use voice search, people are going to be asking questions, not necessarily typing in standard keywords. So, when you’re writing your blogs or your content, look at it from a voice search point of view. Are you answering a question that the user is using to find what they’re looking for? In this instance, this go way back – way back? Three years feels like a long time. And, it’s simply how do I add Google Reviews to my website? So, we answered the question in as much detail as possible, added in some imagery and kind of how to, and that blog post now is being picked up those Google snippets on how do I had Google Plus Reviews and various terms as well. So, it’s more than just a first place on Google. So, still, organically this is the first place here. The actual blog article appears third organically. But, you jump the line massively once you start appearing into these snippets. There are tons of different ways that you can use this. This tab up here, Am I Pregnant. No, I’m not. It’s not a mistake that I had that there, that is actually the most asked question on Google, just over 90,000 times a month people type that into Google. I don’t know why they don’t just take a pregnancy test, but hey, hey. And you can see the Baby Center and the Baby Center again and another website there. So, they’ll be getting a good 33+% of all the traffic that comes through those 90,000 searches a month. Most businesses are set up to solve a problem the customer has. So, if the customer has a problem, what questions they aren’t asking early on in the stage before they realize that you’re the solution to their problem. Say if you’re a wedding event coordinator, it would be, where are the best locations for a wedding in Canada? Or, how do I propose to my wife? All of these kinds of questions that come up in the early stage of somebody doing their research and discovery for potentially you and your products and your services. Make sure you’re writing content and blog articles or building videos and content around answering those important questions. So, it’s going to do a few things, it’s going to get you up into these People Also Ask snippets, but it’s also going to build trust and authority on that you kind of know what you’re doing and you know how to delivery that service or product and being the authority in that area. But for now, I just wanted to give you a quick highlight here on the People Also Ask snippet, I think it’s going to be pretty interesting as Google rolls out more and more of those. Take full advantage of that. Again, recapping on that, making sure that your content is answering the most important questions your potential customers are asking. Okay, that’s it for now, see you later. ← Is The Sea-to-Sky Growing Into A Digital Heaven?